Are you ready to take your business or career to the next level? Do you want to feel happier, more fulfilled, and more excited when you think about your work? 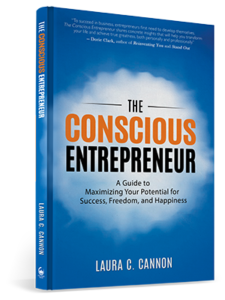 In this profound introduction to conscious entrepreneurship, author and business coach Laura C. Cannon teaches you how to harness your unique gifts and the power of your own consciousness to maximize your satisfaction – and deepen your enjoyment – of your business and your life. Grounded in research from the fields of modern psychology, eastern philosophy, and personal development, this book explains six core principles necessary for radical, transformational change – personally and professionally. By teaching you to use your business as the vehicle for your personal growth, The Conscious Entrepreneur delivers timeless wisdom and practical exercises to help you think, act, and live the path to your highest potential – without adding to your already-packed schedule. Forget work-life balance, get ready to shift into work-life integration for more happiness, stronger relationships, and a higher return on your investment in every sense of the word. Featured on Style Network’s Whose Wedding Is It Anyway? 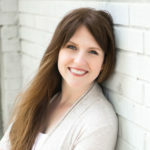 A member of the prestigious National Speaker’s Association with more than 15 years of experience as a professional public speaker, Laura has a knack for delivering engaging and informative presentations. She’s spoken to groups ranging from 12 to 5000 on a wide range of topics, from office productivity to motivation and empowerment to mindfulness and meditation. Her true passion as an author and speaker lies in bridging the gap between business and spirituality, finding practical, down-to-earth applications for timeless universal wisdom. She has been a guest speaker for colleges, civic organizations, businesses, and associations. Laura holds a B.S. from Towson University and an M.A. in Human Sciences (Psychology) from Hood College with a specialization in Thanatology and Grief Counseling. A lover of all things that blend the practical and the spiritual, Laura is also a 200hr RYT yoga and meditation instructor. Bonus Content Just for Subscribers! 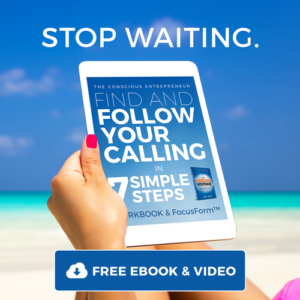 This interactive workbook and video exercise will help you zero in on exactly what motivates and drives you at the deepest level, and formulate an action plan for harnessing that power to achieve your dreams. It even includes a version of the same FocusForm™ that Laura uses herself to stay focused on her own calling!